The newest design feature offered for Cross Country greenhouses, the decorative base panels are a great option for those homeowners wanting a fully finished appearance for their greenhouse. This high style panel eliminates the need and cost of a concrete foundation as all that is needed is just one row of 4x4's! 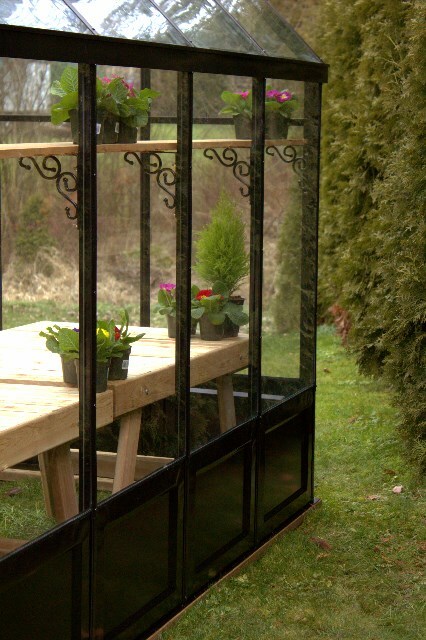 The panels are now available in any color or size of greenhouse for single tempered glass. Color: White, green, brown or black. For custom colors, please ask for a quote. Style Options: Any straight eave or curved eave greenhouse design. Door: 32"x76" door with no door drop to match the kick panel and provide a clean aesthetic.